Wi-Fi has become business critical; there may be no more of an understatement in tech than that. No matter where one goes – carpeted offices, airports, hotels, coffee shops, you name it -- people need Wi-Fi to stay connected and get work done. When workers were out of the office, they used to say things like “I’ll take care of that when I’m back in the office,” but now we can perform pretty much any task regardless of where we are. This week Aruba, a Hewlett Packard Enterprise company, announced a new family of 802.11ax IoT-ready access points. Aruba is referring to these as Wi-Fi 6, indicating that it’s the sixth generation of wireless technology. The company also announced a number of access switches along with new features in the areas of security, power management, AI-based automation, and service assurance to deliver Wi-Fi that’s more in line with the rest of the enterprise network. The thesis behind Aruba’s product is that the network edge has changed and become what it calls the “Experience Edge.” There’s some validity to the picture Aruba is painting, as many digital transformation projects rely heavily on Wi-Fi to deliver new experiences to capture opportunities. This includes new ways to shop, learn, treat patients, collaborate, and anything else you can think of. Problematic Wi-Fi means unhappy customers and lost revenue. A poor Wi-Fi experience can be the difference between digital success and failure. For example, a hospital may implement a telehealth program where doctors can meet with patients using video on a tablet. Erratic Wi-Fi would make the video call unintelligible and cause the patient to possibly miss out on key information. The Aruba 510 Series -- The 510 Series is a new line of 802.11ax access points (APs). There are other pre-standard ax APs available on the market, but these are the first to be Wi-Fi Alliance (WFA) certified for the new WPA3 and Enhanced Open security standards. WPA3 and Enhanced Open are complementary to one another. The former enables stronger authentication and encryption for data sensitive industries like financial services. The latter improves data privacy in open public networks where authentication is not used such as public venues with free Wi-Fi. Aruba is also the first Wi-Fi vendor to integrate Bluetooth 5 and Zigbee into its APs to enable IoT use cases such as smart door locks. Bluetooth 5 adds some interesting enhancements for low-energy operations as well as optional higher bandwidth for longer-range connections. Smart Energy Management -- The increased performance means more devices can be connected at higher speeds, which increases the power requirements. Green AP is a new feature in Aruba’s NetInsight product that enables network administrators to intelligently manage APs to reduce power utilization by up to 72%, which saves energy and cuts costs. The Green AP feature also automates the process of shutting down APs when they are not being used and then brings them back up when users need to connect. This is ideal for airports, conference centers, and other venues with lots of transient users. Also, the APs include a feature called Intelligent Power Monitoring (IPM) that measures the power utilization of an AP and adapts to available power. IT can create policies to prioritize which capabilities to disable when an AP is operating over a defined power budget. Aruba 2930M Layer 3 Access Switch -- Highlights include zero-touch deployment capabilities, REST APIs, smart stacking, and 802.3bt PoE for 60W of power per port versus the current 30W. The higher power can be used for newer APs but also IoT endpoints and many video cameras. The 510 Series APs are available now with a list price for $1,095. The 2930M access switch is also currently available and has a list price of $10,799. The new version of NetInsight with Green AP will be available in Q1 of 2019 and is priced at $50/year per AP. 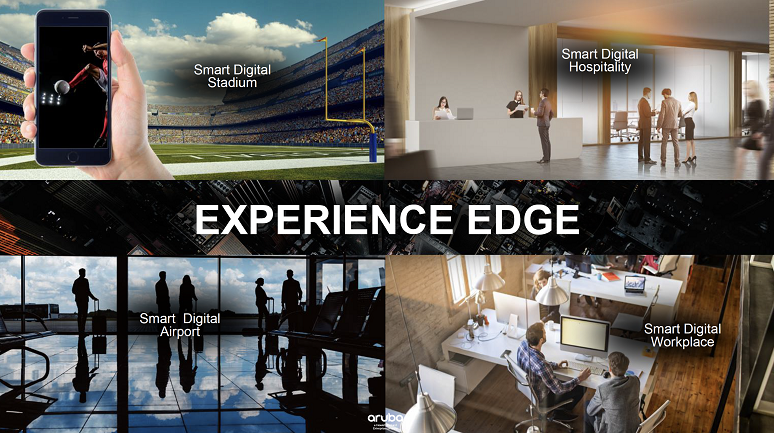 The experience edge is real and is driving higher levels of traffic on business networks. Success in the digital world requires new applications and business process change but also a high-quality Wi-Fi network built on a rock solid wired foundation.